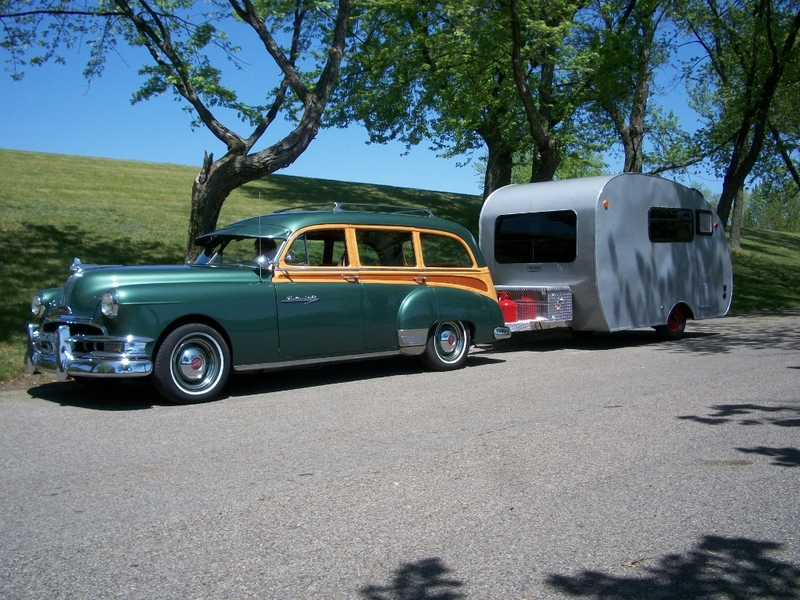 That’s us, rolling into Milford last Thursday for the Tin Can Tourist’s Spring Meet with the Tini-Home in tow. No issues, although as I predicted, it doesn’t save any money on fuel towing as opposed to the (very slippery, and much larger) Spartan Manor. We were very comfortable in it, and it was a big hit at the show, owing much I’m sure to the fact that so many TCT members have been following the build here at “Cool McCool’s Garage”. It’s nice to have fans! 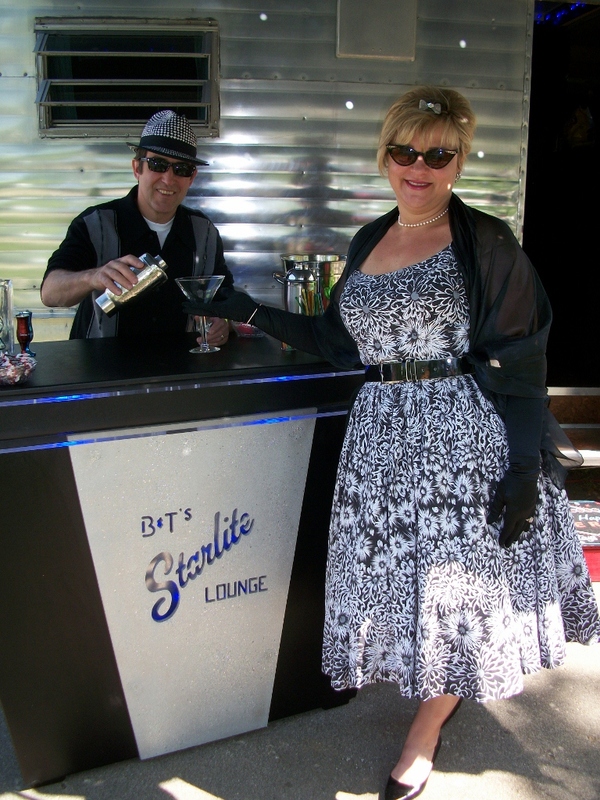 We were parked next to our friends Baron and Terri who had their ’55 Pontiac motor-home conversion, “The Starlite Lounge”. They’d just finished up the bar, and kept it stocked all weekend long. Baron, aka “Frank Sinatra”, mixes some mean shooters, and kept us well lubricated. 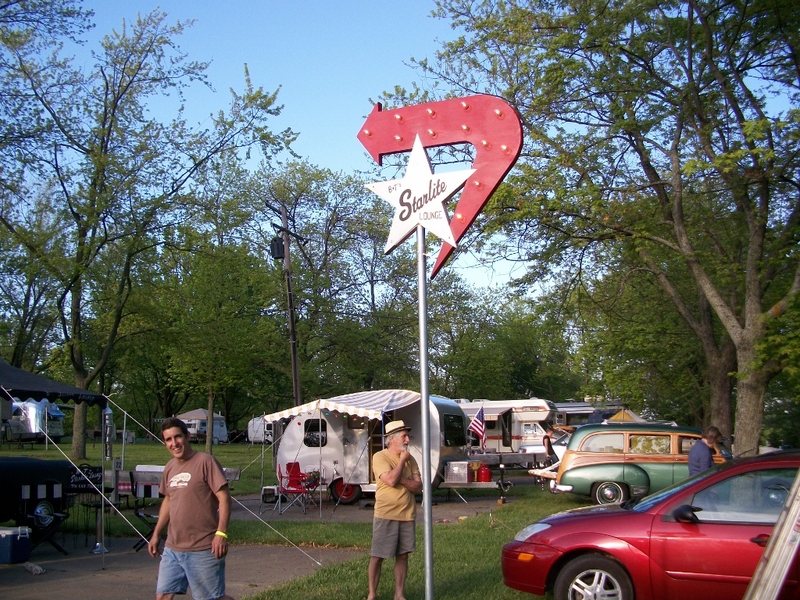 Between him and the Tiki Bar behind us serving Margaritas, it was the best spot in the entire campground! 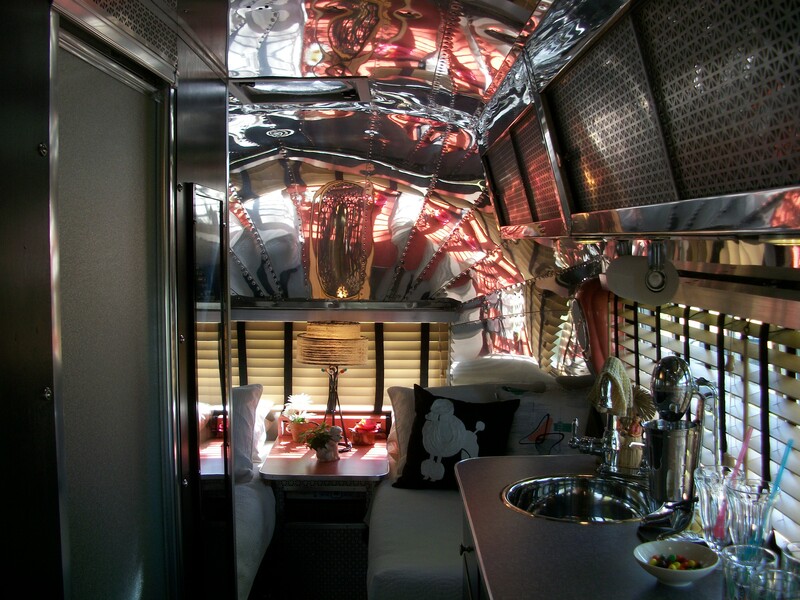 Slightly dizzy-ing but oh-so cool, this late ’50’s Airstream with a completely polished interior was inspiration for me for the soon-to-be dragged home ’47 Spartan. The owners decided on the full polish while stripping paint from what they thought were the wood framed cabinets. When they got through all 6 layers of flaking paint, they found aluminum, and just kept stripping. It’s WAY cooler than the picture can give credit for, a real mind blower. Anyway, the thrash is over here at the home office of CMcC’s Garage, and we can now focus on the Diamond T. The plan is to get it dialed in and do the Lincoln Highway Tour next summer, so stay tuned as we get busy finishing that, the road trip to get the Spartan home, the GMC painted, and chopped ’59 T’Bird whipped into shape to finance all this stuff. It should be fun, so keep following along! Love the trailer and it looks even better behind wagon! Love the trailer, but it needs hub caps.